What is the SLA on replication lag in a Sql Azure Failover group? 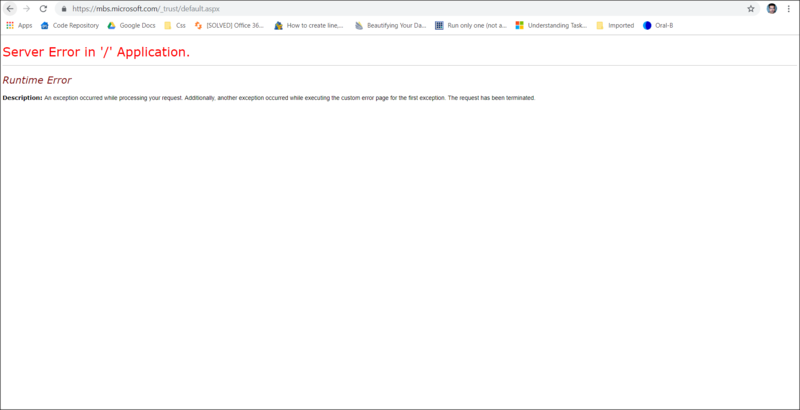 Microsoft docs for Dynamics 365 guide links to a webpage which results in "Runtime Error"
I am trying to integrate Active Directory ADAL plugin within my Reactjs app but I am getting CORS error when fetching results. I was following React ADAL package steps till I found a SO question which helped me a lot, but still I am getting a CORS error while fetching Dynamics CRM data. I kept the comments in case you suggest me to make the fetch request with the ES7 approach instead of the ES5/6. 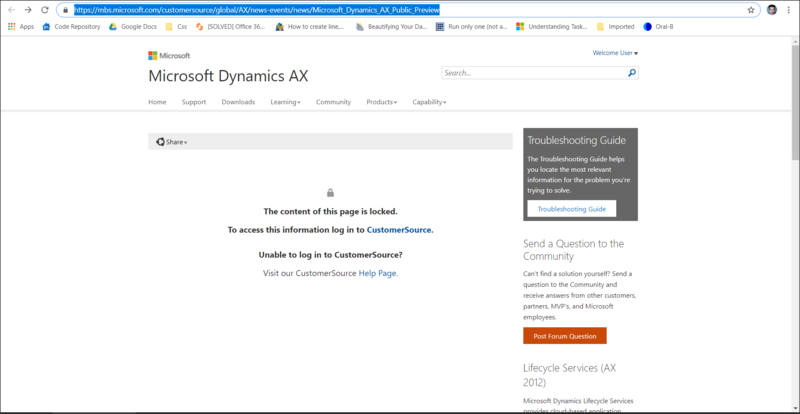 Access to fetch at 'https://login.microsoftonline.com//oauth2/authorize?client_id=0&response_mode=form_post&response_type=code+id_token&scope=openid+profile&state=OpenIdConnect.AuthenticationProperties%-SNnykyS3kfmCGv0ar3tRJMn0XvPSwEAAAABBBBBCS5yZWRpcmVgdClodHRwczovL25ld2NvMi5hcGkuY3JtMi5keW5hbWljcy5jb20vYXBpLw%26RedirectTo%3dhttps%253a%252f%252fmyorg.api.crm2.dynamics.com%252f&nonce=636848908126477531.RGFhOTkxMzQtqDRlYy00Nzk3LThkZDgtZjk5MjA5MDM3Nzk5MWQyMTE4OWQtODNjMy00YzhhLTk2YjMtMzY4MmQ0MzFkZjU5&redirect_uri=https%3a%2f%2fcloudredirector.crm2.dynamics.com%3a443%2fG%2fAuthRedirect%2fIndex.aspx&max_age=86400' (redirected from 'https://myorg.api.crm2.dynamics.com/api/') from origin 'null' has been blocked by CORS policy: Response to preflight request doesn't pass access control check: No 'Access-Control-Allow-Origin' header is present on the requested resource. If an opaque response serves your needs, set the request's mode to 'no-cors' to fetch the resource with CORS disabled. Any ideas on what is wrong here? Thanks in advance. This is a CORS issue. CORS stands for Cross Origin Resource Sharing. CORS is a security feature implemented by your browsers. Because of this our browser is going to be suspicious, this behavior can not be changed, its hard coded in every browser. "Hey API, I'm trying to make a request over do you. The request is coming from a website at some-domain.com, it seems strange, what do you think?" The API has the option to either allow or disallow the request. In your case, the API response: "Hey browser, I agreed with you, this seems strange. You should only allow this request if your coming from the-other-domain.com"
A thing to keep in mind is this is a Browser security. If you make this request form e.g Postman or CURL at the Terminal. Postman says: "You know what, I don't care if you make a request to a different API. Im not the browser and you can do anything you want." Postman and similar applications don't have CORS stuff so they don't care. That's whats going on to answer your question. I am beginner for Angular and Angular 6. I have self studied lots more about Angular 6 but I need to clarify and study all Angular Directives. The problem is that tags (links) don't show in print and some blank space is shown instead of those. I want to show links as like as data. I am creating timer component and implement with every task. So when I start my timer for single task then other task timer will be disable or hide. I am trying to disable other timer component when start timer but it give me only value for current component. So how can I update all component when start single timer. Here I am posting my code here. Anyone please suggest me a solution of this issue. In a Sql Azure failover group, the data is asynchronously synced from primary to secondary. What is the expected lag between the two? What is the worst case lag as per SLA? I am trying to run my mail service using Postfix and Azure Active Directory. The idea is to use the Azure Active Directory (AD) Domain Service LDAPS as the ldap backend instead of a on-premise Active Directory service. 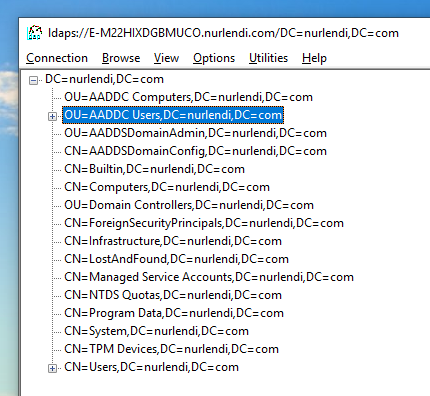 I can see users I created via Azure Portal in OU=AADDC Users, DC=nurlendi,DC=com. How to read the Tree view in ldp.exe? Does each child node under DC=nurlendi,DC=com represent a table in the database? If so what is the schema of the table ? What does OU, DC, CN mean respectively? I tried to find some documentation but my google-fu has failed me. 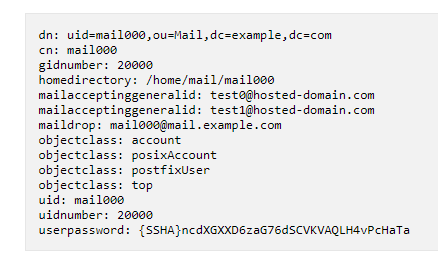 According to the Postfix LDAP documentation, the default configuration of Postfix expects two LDAP attributes in the LDAP schema: mailacceptinggeneralid and maildrop. Does that mean add a new schema for Postfix users? Can I edit the Azure AD schema via ldp.exe? I found a tutorial on how to add these two attributes in an openldap backend by downloading and installing a LDIF file. Am I creating a new table specific for Postfix user or extending the schema of the User table to include add two new attributes? How can I set values for these two new attributes? Not via Azure Portal I assume. 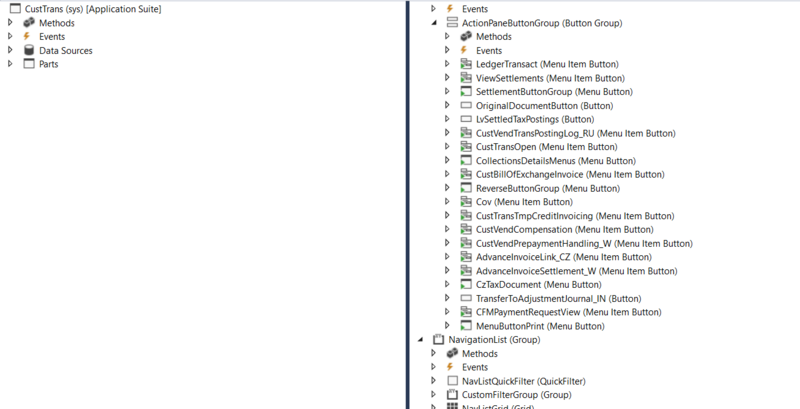 "value":"[concat('/subscriptions/', parameters('SubscriptionId'), '/resourceGroups/', variables('ResourceGroupName'), '/providers/Microsoft.Logic/workflows/', variables('NestedLogicAppName'))]"
It opens up this page https://mbs.microsoft.com/customersource/global/AX/news-events/news/Microsoft_Dynamics_AX_Public_Preview which shows the message "The content of this page is locked. To access this information log in to CustomerSource." It will be helpful if someone forwards it to somebody from Microsoft or they notice it! I'm trying to display the selected values of a MultiSelect Option Set in a custom page in Web Portal with Liquid Template. I wrote the FetchXml query anf if i test it the query in XrmToolBox, it's return the field with values. Do you have any idea about this behavior?